A growing number of people are living with dementia in New Zealand. In 2014 there are more than 50,000 people with dementia and this is expected reach 88,000 by 2030. Compared to other diseases, dementia has a big impact if counted in the number of years of healthy life lost as a consequence of the condition. Alzheimers NZ estimated the economic impact of dementia in New Zealand in 2011 at nearly $1 billion. The NZ Government launched a Framework for Dementia Services in 2013 aimed at guiding the development of services for people with dementia, and the National Dementia Cooperative is a key network supporting its implementation. NZCCSS member organisations provide many support services for older people with dementia and there are many issues for those services going into the future. Most important is to find ways to supporting people early so that they can learn to manage their condition and avoid getting into emergency situations. There needs to be more investment in models of community based support for people with dementia in their own homes, day activity programmes, alternative supported living options when people cannot manage in their existing house and sufficient specialist dementia care facilities are available for those with higher levels of dementia. More training is required for those working with older people to help them better understand and meet the needs of dementia suffers. All these services need to be funded at a level that is enough to ensure long term stability and sustainability of the services. 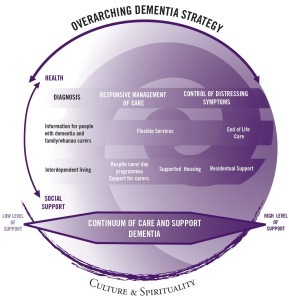 In 2009 the NZCCSS Working Together We Can Respond to Dementia project took an in depth look at some responses to dementia within our social services networks. You can read the full project report here.